Woman In Digital: Who Will Be The First #IamAirAsiaTravelPhotographer? Who Will Be The First #IamAirAsiaTravelPhotographer? Starting July 21, four Filipino contenders will travel around Asia for the first #IamAirAsiaTravelPhotographer Contest. AirAsia and Nikon launch the first #IamAirAsiaTravelPhotographer contest. The contestants will be traveling around exotic places in Hong Kong, Indonesia, Malaysia and Thailand to capture their best entries across a range of categories that include landscape, food, portrait, architecture and travel. Best of all, they will be guided by four multi-awarded photographers and respected leaders in the industry for the AirAsia Travel Photographer contest as mentors of the four contestants. 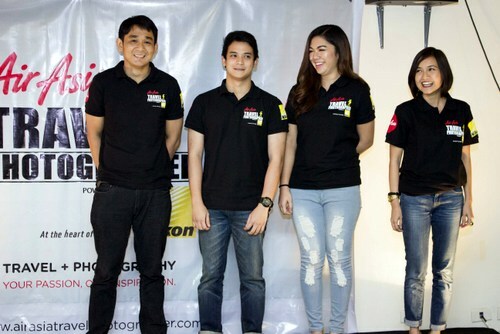 Nikon Pros George Tapan, Raymond Cruz, Parc Cruz and AirAsia’s resident photojournalist Adam Lee. Two office workers, a car salesman and a barista are stepping out of their comfort zones and into the challenges of becoming the first AirAsia Travel Photographer for 2015. The #IamAirAsiaTravelPhotographer contest is jointly organized by AirAsia and ThinkDharma Inc. (exclusive distributor of Nikon Digital Cameras) in partnership with AirAsia’s global loyalty programme, BIG which will award winners with over 200,000 BIG Points or its equivalent free flights to any of AirAsia Group’s 100 destinations. Assisted by multi-awarded photographers from the Philippines and Malaysia as their personal coach, four pre-selected contestants, namely Velvet Lagman-Macasaet, an executive assistant and marathon runner; Sarah Garcia, hotel front desk officer; TJ Nepomuceno III, car salesman; and Paul Delfin. For more information, stay tuned and follow hashtag #IamAirAsiaTravelPhotographer and get the latest updates via Twiiter or Facebook. AirAsia Philippines Chairperson Maan Hontiveros led the launching of the exciting contest with Strategic Partnership Head Jenny Au and Senior Marketing Manager Caroline Wong of AirAsia BIG. ThinkDharma Inc., meanwhile, is represented by Abrigo Merin, Chief Executive Officer of OPAL, and Paolo Salazar, Head of Business Unit. There will be an online voting at www.airasiatravelphotographer.com which will be open to the public in August 20 with Nikon cameras and BIG Points to be given away to lucky voters. Grand winner will be announced in September 11, 2015.
Who will be the first #IamAirAsiaTravelPhotographer? Stay tuned.